IATROS International is situated in Brandwag, a central business area in Bloemfontein. 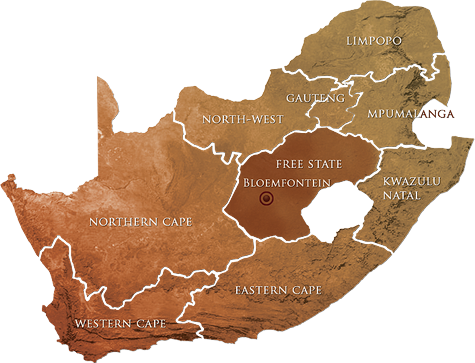 Bloemfontein is home to about 400 000 people. A diverse population with a variety of social and cultural groupings has access to excellent and modern facilities, including two universities (one with a respected medical school), four private hospitals, one military and three academic hospitals. Extensive and internationally recognised pharmaceutical research, meeting the highest standards, has been conducted by Bloemfontein’s academic institutions and private laboratories over the past few decades. Some of the owners and staff members of IATROS International have been involved with these clinical trials for a number of years, ranging from two to 20 years. The research unit is situated about 700m from Mediclinic Bloemfontein hospital, one of the major private hospitals in Bloemfontein, giving us fast and easy access to laboratories, radiological investigations, emergency facilities and other specialist support. Patients visiting this hospital thus also have easy access to the IATROS International research unit. The city’s infrastructure (e.g courier services and transport facilities) is excellent. The Brandwag location of the research unit places us on the mainstream routes of these support services, which are well experienced in handling samples and other material for national and international transport.